Melbourne psych-rockers Money For Rope have released the new video for ‘Actually’, lifted from their forthcoming new album ‘Picture Us’ for March 8, 2019, following international tours which have previously taken in shows across Primavera Sound, Glastonbury & SXSW, alongside support slots for Courtney Barnett (also an early champion of the band). Details of a 2019 UK headline tour from Money For Rope in support of the new album are soon to be announced. 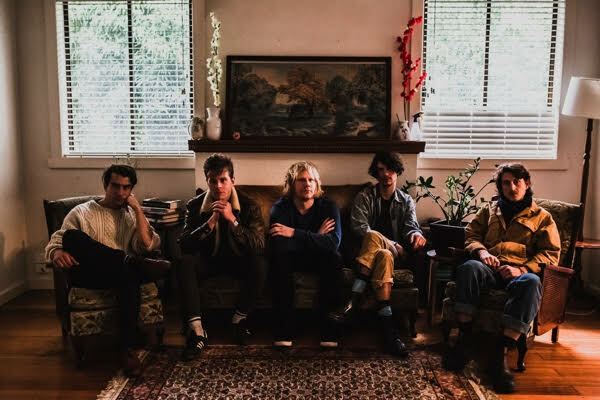 Spawned from the same fertile Melbourne music scene which has fostered not only Barnett but also other friends including King Gizzard And The Lizard Wizard, Amyl And The Sniffers and Rolling Blackouts Coastal Fever, Money For Rope are releasing ‘Picture Us’ off the back of a dogged touring habit which has kept them on the road for the last four years. Entirely self-produced, mixed & mastered by the five piece – comprised of Jules McKenzie (guitars, vocals), Rick Parnaby (keyboards), Erik Scerba (drums), Chris Loftis (drums), Ted Dempsey (bass) – ‘Picture Us’ was recorded over the course of a single summer in Victoria, Australia on the coastline of the Southern Ocean. Whilst everything Money For Rope does is buoyed by a freewheeling ‘Why not?’ attitude – including a mini tour across India, and McKenzie honouring various live commitments following a motorbike crash by performing from a wheelchair – don’t be fooled by that derisive band name. ‘Picture Us’ thrums with the promise of one of Australia’s most hard-working and charismatic new bands.